I don’t know what my human was shopping for at Ross Dress For Less, but she didn’t find it. Instead, she came home with three new spring dresses for me. Yes, I know you only see two here. But we got set up for the photo shoot and she realized she forgot to cut the tags off of one, and she didn’t have scissors handy. So you only get to see two today. Maybe I will model the other one later in the week. The dress with the hearts and blue bow is really cute. It may be just a tad big around the armholes, but the next size down would have definitely been too small for me. The flower dress with the pink bow was a better fit. I even tried accessorizing this dress with my favorite straw hat. Yes, it is straw hat weather here in California now! I am looking forward to getting outside more and wearing fun dresses. 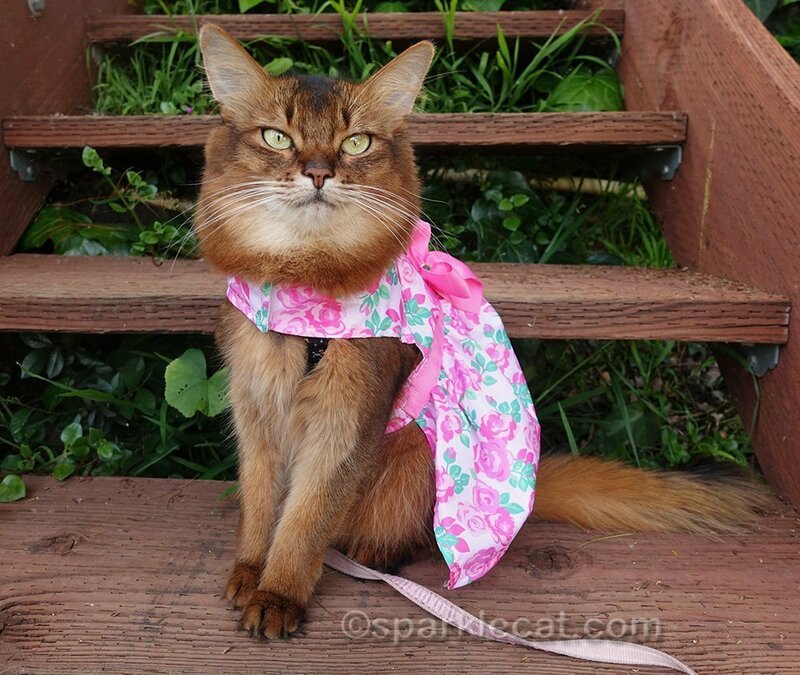 I hope you enjoyed my new spring cat fashion! Meow meow Summer you are stunnin inn yore mew dressess!! Mee likess second dress best! 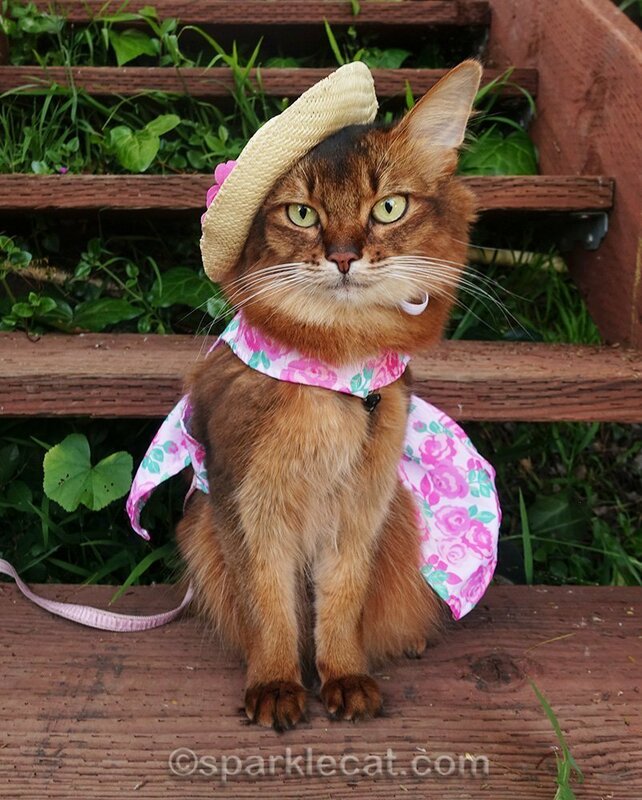 An tHE straw hat iss purrfect with yore dress. 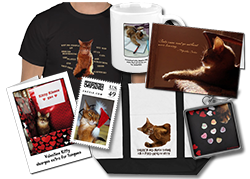 Seein you so purrty makess mee ‘all most’ want to start wearin clothess too, mew mew mew…. LadyMew all most fainted when shee saw yore photoess!! Oh my goodness! you simply could not look cuter in your straw hat and spring dress. I love the picture where you’re wearing the hat! Very pretty! What cute dresses! 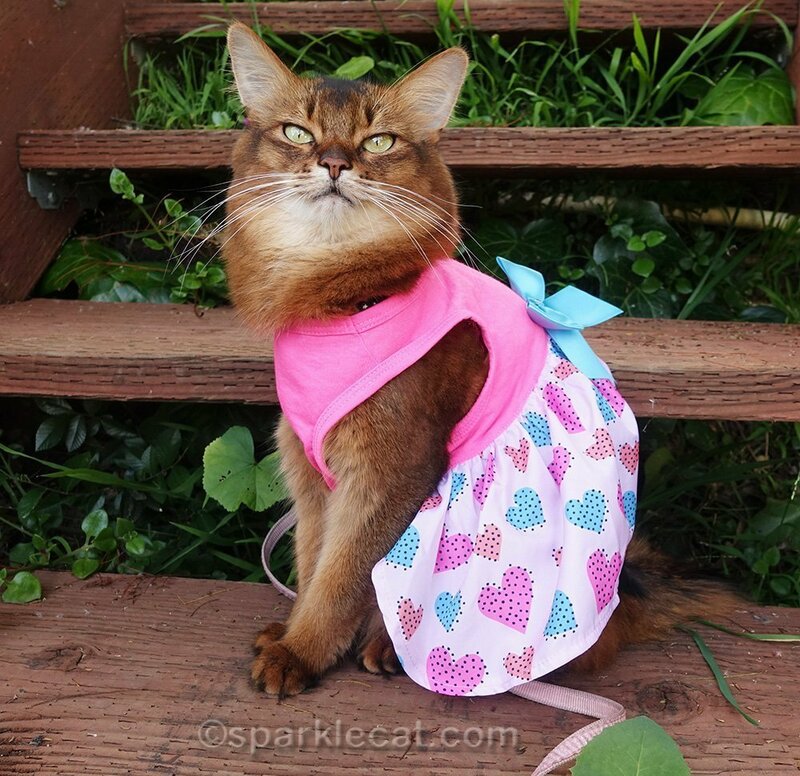 You’re definitely the best dressed kitty in LA! We love both, honey! You’d rock a burlap sack says MK! I love both of your new dresses, but I think I prefer the one with flowers on it. You are ready for spring. Are you also a Somali? Superb! You human has good taste in frocks, for sure. The latter is our favourite and the accessory hat sets it off a treat…. I really do not understand why you haven’t been offered a proper modelling contract? My goodness, you are pretty in pink! Absolutely gorgeous. You are a natural model Summer! Excellent modeling, Summer! We love how you accessorized with the straw hat in that last shot. You look so cute!! Much better selection of clothes for girl kitty. You are definitely more stylish than I am, Summer! And much better looking! Summer, love the straw hat with the pink bow flower dress. You have more patience than my Tori does. She won’t let me dress her up at all. I love the hat. Very chic. You are just a little doll, Summer! Too cute for words, Summer! You’re definitely rocking a pink frock for Spring. Summer I do love your paw placement very super model form. Those are so cute! I love the picture with the straw hat – very spring sassy! 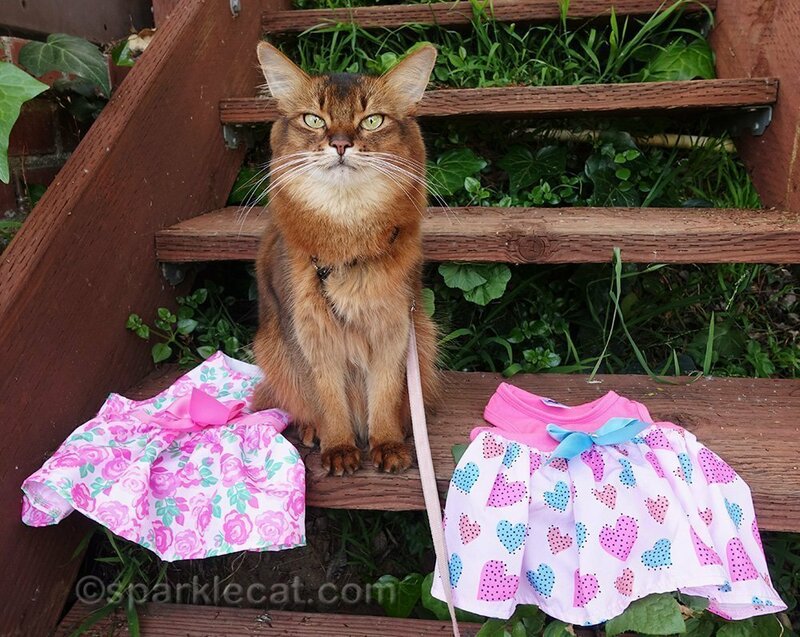 You definitely belong on the cat walk, Summer…MOL!! you definitely look ready for spring. Summer…you are ready for summer! You are a BREATH OF SPRING Summer…….love both of your new dresses – they are “you” !! Oh Summer…again I’ll say I wish you could wear your dresses to your therapy visits. People would be totes enchanted!!! They are anyway but seeing you in those…oh my goodness. 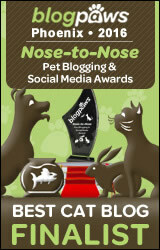 And yes, think your paw placement was spot on! Beautiful dresses on beautiful Summer! So pretty! You’re ready for a garden party. You sure look pretty sweet Summer and I love your hat too! 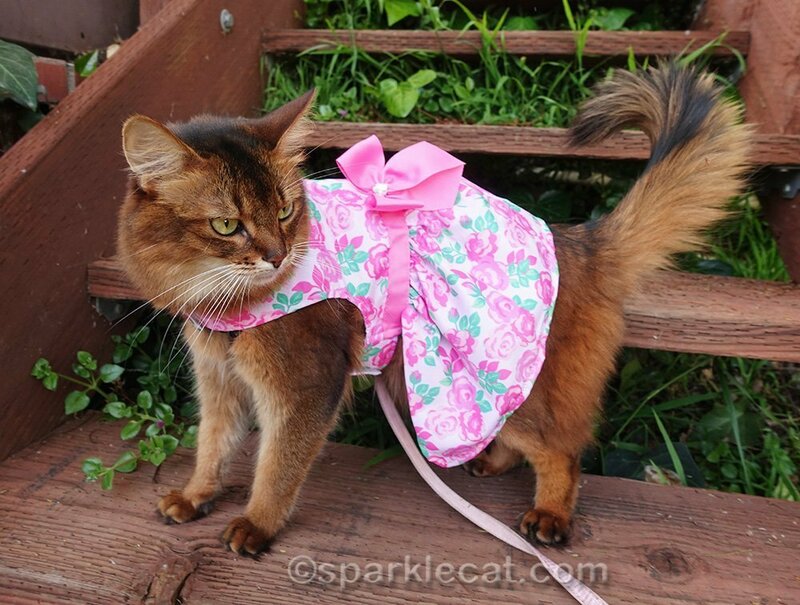 You look purrrfect in your spring finery. You look pretty in your new dresses, and the hat is very cute. Those are two very pretty dresses. Makes a kitty get excited about the coming Summer!! for the cold! Now the Spring is started! Those are beautiful on you. We are so ready for spring here!